The postconviction prison disciplinary records of capital defendants (n = 73) who had been the subject of defense-sponsored violence risk assessments or risk-related testimony (1995–2007) that asserted an improbability of future serious prison violence were analyzed. During postconviction prison tenures averaging 4.4 years, none of the capital defendants was cited for accomplished serious assaults. The prevalence of misconduct was inversely related to severity: 54.8 percent were cited for some disciplinary misconduct, 27.4 percent for potentially violent disciplinary violations, 12.3 percent for assaultive misconduct, and 1.4 percent for attempted serious assault. Rates of misconduct among the capital offenders were equivalent to those among all inmates (n = 18,561, annual average) in high-security federal prisons (2001–2005). The accuracy rate of forecasts of improbability stands in sharp contrast to that of prosecution-sponsored expert testimony at capital sentencing that had asserted high rates of future violence. An individualized consideration of aggravating and mitigating factors has been a constitutionally mandated aspect of death penalty determinations since the resumption of this sanction in the aftermath of Furman v. Georgia.1 The potential future violent conduct of the capital defendant is one such particularizing factor (see Jurek v. Texas2). In Texas and Oregon, this consideration is a “special issue” that must be answered in the affirmative for a capital offender to be sentenced to death (i.e., “whether there is a probability the defendant would commit criminal acts of violence that would constitute a continuing threat to society”3). In many other jurisdictions, the “future dangerousness” of a defendant may be alleged as a statutory or nonstatutory aggravating factor at capital sentencing. Alternatively, a positive or nonviolent adjustment to prison may be offered by the defense as a mitigating factor (see Skipper v. South Carolina4). Death-sentence verdicts may turn on this consideration of future conduct. Concerns about the future dangerousness of a capital offender appear to be of critical importance to a capital jury, whether or not this prospect is directly addressed at trial (Blume et al.5). Accordingly, more recent amicus briefs addressing expert testimony at capital sentencing filed by the American Psychological Association in United States v. Fields46 and the Texas Psychological Association in Espada v. State of Texas47 did not argue against the legitimacy of capital risk assessment testimony in general. Rather, these briefs contrasted the methodology and group statistical underpinnings of an empirically supported capital risk assessment, with the inadequacies of clinical/intuitive approaches that emphasize the capital offense, aberrant behavior, and personality features of the defendant. Serious institutional assaults are specified as a predictive threshold in the capital risk-assessment reports and testimony, as well as in risk-related testimony by state- or defense-retained mental health experts, as this severity of misconduct seems most proportional to a preventive intervention of execution. This convention is consistent with capital application by Slobogin49 of the “legality principle” (i.e., that government intervention is not justified to prevent minor harms, particularly when execution is the contemplated intervention). Edens et al.21 addressed this concept of proportionality of intervention in practical terms of how a capital jury views its task: …[I]t is difficult to imagine that capital jurors would believe that their charge to identify inmates who would engage in “serious acts of criminal violence” should encompass those inmates who will throw urine at a guard at some point in the future if not put to death [Ref. 21, p 63]. No published study, however, has reported the prison violence outcomes of capital offenders whose sentencing trials included expert testimony utilizing group statistical data on rates and correlates of prison violence, as well as descriptions of correctional security capabilities, in asserting an improbability of serious prison violence by the respective capital defendants. Although the group statistical data on rates and correlates of prison violence point to a high accuracy rate for risk findings of improbability, this inference has not been tested in capital cases that were subjected to defense-sponsored violence risk assessment for prison or risk-related testimony. This study was intended to address this void in the current literature. The forensic case files (1995–2007) of the senior author were reviewed to identify all defendants who had been the subject of an individualized violence risk assessment for capital sentencing by him, as documented by a report, demonstrative exhibits, or sentencing phase transcript. Also identified were all cases in which he had testified as a “teaching witness” (described in Refs. 15,16,19) in detailing the methodology and relevant group statistical data that would be employed in a violence risk assessment for prison or the security capabilities and effectiveness of the correctional department in that jurisdiction in minimizing the occurrence of serious inmate violence. In cases involving either risk assessment for prison or risk-related teaching witness testimony, a similar risk methodology had been utilized or described. Rates of institutional violence among convicted capital offenders, convicted murderers, offenders sentenced to life without parole, and variously, general or high-security prison inmates, were both described and utilized to anchor the risk estimate. 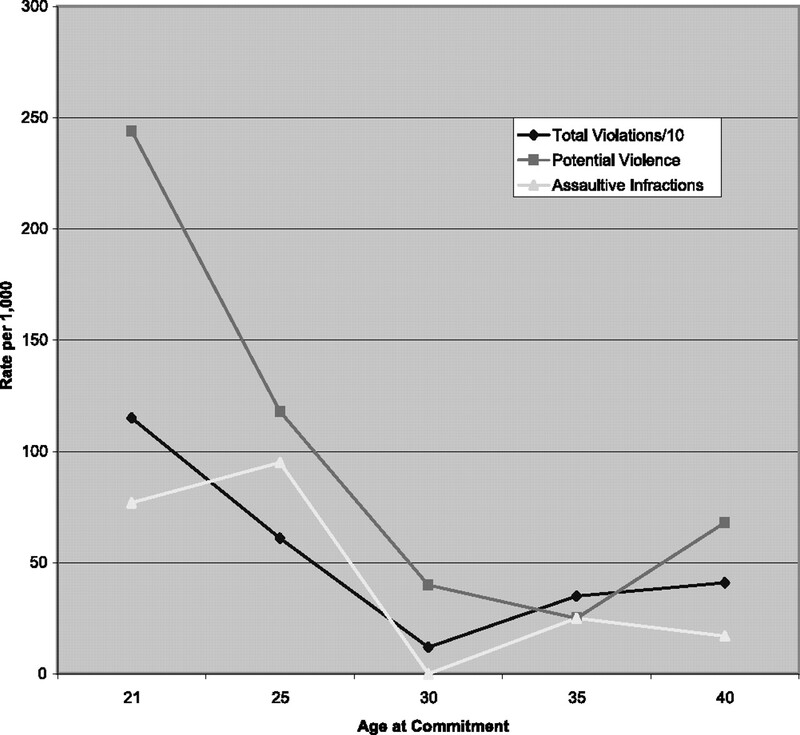 Rates of violent misconduct were disaggregated by severity, with more serious violence demonstrating progressively lower frequency and prevalence. These rates and the associated origins of the data were detailed through digital demonstrative exhibits and explanatory testimony in cases in which court testimony occurred.14,17,26,29,30,32,36–39 Empirically derived correlates of prison violence17,22,29,34,36,39 were often described, and again, illustrated with specific findings from various studies—for example, age (inversely correlated), education (inversely), prior prison sentence, prison gang membership, past prison violence, and length of sentence (inversely). Intuitive factors that are not predictive of serious prison violence (e.g., conviction for murder or capital murder, life-without-parole sentence, antisocial personality disorder, or psychopathy) were also described and illustrated with representative studies (see summary of research findings listed earlier in the article). If an individualized violence risk assessment for prison was performed, these correlates were applied to the offender in question (for a sample report, see Ref. 52). As they became available, actuarial models22,34,36,39 were also utilized in these individualized violence risk assessments for prison. Jurisdictional-specific preventive interventions, such as treatment, discipline, and super-maximum-security confinement, were also described in testimony. For example, correctional regulations typically specify the security level(s) at which capital offenders (or those serving nonparolable sentences) will be confined. Base rates of inmate violence specific to those security levels were described where available. These corrections perspectives and data provided broad support for two findings. First, departments of correction are quite effective in limiting the most severe forms of violence. Second, should the defendant be identified by corrections professionals as a disproportionate risk, confinement options (i.e., super-maximum custody) are available that virtually negate the opportunity to commit serious violence. As a practical matter, despite the allegation of future dangerousness at capital sentencing, life-sentenced capital offenders are routinely placed in the general prison population of high-security prisons rather than in super-maximum-security units. The inclusion of cases in which risk-related, but not individualized, testimony occurred was consistent with both full disclosure and the obvious implication of risk-related testimony that correctional capabilities/interventions would render future violence in prison unlikely. Forty-four federal capital cases and 123 state capital cases were identified as fulfilling the above-described criteria. File data on the demographic characteristics and prison behavior of 43 of 44 federal capital inmates in question (data were unavailable for one federal capital inmate) were obtained from the Federal Bureau of Prisons. File data on the 123 capital inmates in state custody were sought by a formal written request outlining this study and specifying that only group statistical data would be reported. Where available from correctional department websites, inmate-specific information was also sought on-line. We were disappointed that, even with assurance of research-participant anonymity, only 6 of 23 state correctional departments provided the requested disciplinary files. The final sample consisted of 73 capital offenders: 43 federal and 30 state capital inmates, reflecting an overall attrition rate of 56.3 percent (2% attrition for federal capital inmates and 76% for state capital inmates). Nonetheless, this sample represented the only multijurisdictional examination of the prison behavior of capital offenders since Marquart and Sorensen28 reported on the institutional misconduct of the Furman1 commutees (1973–1988). Characteristics of this sample are provided in Table 1. Because this study was based on retrospective review of archival data and only deidentified/group data were reported in our findings, individual informed consent was not sought. This procedure was approved by the Institutional Review Board, Office of Research and Development, Prairie View A&M University. To minimize the potential for bias, given the role of the senior author in conceptualizing the risk assessment procedures, performing the assessments, and subsequently reporting on the accuracy of the assessments, two research assistants independently reviewed the case files and correctional data on each participant. To provide additional independence of the findings, statistical analysis of the data spreadsheets prepared by the research assistants was independently performed by the second author. Case reports, demonstrative exhibits, and transcripts were first reviewed to determine the type of assessment or testimony that had occurred (i.e., risk assessment for prison or risk-related teaching witness). Although prison violence was forecast as improbable in all of these cases, the degree of improbability varied. Accordingly, if a risk assessment for prison had been accomplished, the final risk estimate for a particular capital offender was independently retrospectively categorized by two research assistants as above, at or below the probability-anchoring base rate of capital offenders sentenced to life terms. Second, demographic data regarding the participants were retrieved from case files and correctional records. Each case file and associated correctional disciplinary record was independently retrospectively reviewed and coded by two research assistants. Even though the primary variable of interest was serious prison assaults (i.e., an assault utilizing a weapon and/or having the potential to cause serious injury), total disciplinary infractions were coded as well as any violations involving violence or potential violence. These disciplinary data were variously specified by type of violence-related disciplinary offenses and severity of violence. Third, discrepancies at any stage in coding by the research assistants were resolved by re-examination of the file in question. As almost no subjectivity was involved in coding the data, a re-examination of the file data produced agreement between the research assistants in all instances. For purposes of this study, violence-related misconduct included the following: threatening bodily harm, possession of a weapon, inciting to riot, escape-related misconduct or escape attempt, engaging in mutual fights, committing minor assaults (including either creating apprehension of harm or resulting in actual physical contact), and perpetrating serious assaults or attempted serious assaults. The aggregate of these rules violations was termed potentially violent. Severity of prison violence was coded in a progressively restricted fashion: potentially violent rules violations, assault, serious assault or attempted serious assault, and assault with moderate or severe injury. Data were analyzed by federal or state capital offender, type of testimony, type of sentence, age, education, and risk estimate. Most important to the predictive accuracy of assertions of an improbability of future serious violence in prison, only one serious assault was attempted, but not completed, by one inmate in the entire cohort. During a total of 318.5 combined inmate years served, none of the inmates were involved in a serious, completed assault that resulted in even a moderate level of injury, defined as resulting in admission to a hospital for non-life-threatening injuries. In fact, the only violence-related injury of note involved sutures following a mutual fist fight. Further, there were no successful escapes and no inmate homicides. Table 2provides an overview of the violence-related disciplinary infractions committed by the incarcerated capital murderers. The first column includes a measure of the total raw number (group frequency) of each type of violation. The numbers in parentheses indicate the group frequencies (where different) with an outlying observation removed. This outlying inmate accounted for nearly one quarter (10/43) of the total potentially violent disciplinary infractions, skewing many of the unadjusted summary statistics. The second column indicates the percentage of inmates (prevalence) involved in any of the violations. The last two columns standardize the frequency of occurrence as a yearly rate per 1,000 for capital murderers and a comparison group of all federal inmates incarcerated in U.S. penitentiaries (USPs) from 2001 through 2005 (n = 18,561 annual average). The findings presented in Table 2 show that even among the various forms of potentially violent rules violations, the less serious variety were the most frequent. Fights between mutual combatants and minor assaults (i.e., requiring no more than first aid treatment, but more typically resulting in no injuries) were the most commonly occurring offenses, followed by threats of bodily harm and possession of a weapon. Attempting to escape (i.e., escape-related misconduct), inciting to riot, or attempting to commit a serious assault were the least common offenses. The percentages show that only one inmate was involved in each of these offenses. Comparisons of annual rates between the current sample and the federal USP inmates, although not a perfectly matched control group, show that the rates of serious or potentially violent rules infractions among incarcerated capital murderers are similar to the rates of such violations among high-security inmates generally (differences are not significant). Table 3 presents rules violations aggregated by level of seriousness. Data included in the first row show that disciplinary misconduct was fairly common, with a majority of the inmates engaging in some form of rules violation. The measure of potentially violent violations presented in the second row included all the specific types of rules violations described in Table 2. Just over one quarter of the incarcerated capital murderers were involved in a disciplinary infraction where at least the potential for violence was present. Assaultive violations of any severity were less common, with just under one in eight of the incarcerated capital murderers perpetrating assaults, virtually all of which were minor. For all levels of seriousness, the rate of violations was similar once again to the comparison group of high-security federal inmates (differences were not significant). Beyond the base rates of various types and levels of disciplinary rules violations, the current study was concerned with the extent to which it was possible to predict the level of improbability of future prison violence presented by capital defendants at sentencing. Although serious assaults were the outcome variable of primary predictive interest, the absence of accomplished serious assaults among this cohort made any further analysis of predictive factors for this level of violence fruitless. Even when a broader operational definition of potentially violent disciplinary infractions was utilized, none of the bivariate relationships among the categorical variables reflected in Table 1 were statistically significant predictors of the prevalence or rate of potentially violent disciplinary violations, probably because of the relatively modest total sample size and associated small cell sizes. Although none of the comparisons reached statistical significance, the distribution of variance in outcome among the predictors matched expectations. As an illustration of these nonsignificant trends, capital defendants in this study who had been assigned a risk rating above the base rate (i.e., improbable but above the violence rate demonstrated in studies of incarcerated capital offenders and other relevant inmate groups) tended to have a higher prevalence of rules violations with violence potential (42.9% versus 21.4%), as well as a trend toward an elevated rate of these rules violations. As expected, inmates with higher incoming educational levels, a GED or high school diploma, exhibited a trend toward a lower prevalence of violent rules violations (16.7% versus 25.6%). As shown in Figure 1, various levels of inmate rules violations tended to decrease as the inmates' age at entrance to prison increased. Some exception to this rule appeared to occur where the rate of various levels of violations dipped slightly among inmates in their early 30s and then increased slightly among those over age 40. The seemingly anomalous results among the older age categories should be interpreted with caution, however, because of the small number of cases at that level and the resultant heavy influence of individual cases. When prevalence was used to measure the outcome, the more typical pattern reappeared, with fewer of the older inmates being involved in serious violations. Disciplinary rules violations by age at commitment. The influence of age on outcome was verified in the logistic regression model presented in Table 4. The exp(β) indicates about a nine percent reduction in the likelihood of an inmate being involved in a potentially violent rules violation associated with each yearly increase in age. The only other significant predictor was the control for time at risk. Overall, the logistic regression model provided a decent fit to the data, with an R2 of 0.294 (χ2 = 16.582; p = .002). As can be seen in Table 5, the accuracy rate of defense-sponsored testimony in the present study is in sharp contrast to that of state-sponsored testimony as reported by Edens et al.21 Whereas state-sponsored predictions of probable violence were wrong (i.e., false positive) in nearly all of the cases, defense expert predictions of an improbability of violence (i.e., true negative) were correct in a similarly lopsided fashion. This investigation represents the first report of the accuracy of defense-sponsored mental health expert violence risk assessments for prison, risk assessment for prison testimony, and risk-related testimony at capital sentencing. These reports and testimony had specified or implied (in the case of teaching witness risk-related testimony) that future serious assaults in prison were improbable. Retrospective review of the prison disciplinary files of 73 capital offenders who averaged 4.4 years in prison found to date that these assertions of the improbability of future dangerousness were resoundingly supported. None of the capital offenders had been cited for an accomplished serious assault, an accomplished escape, or prison homicide, and only one had attempted a serious assault. The experience of these capital offenders to date reflects a markedly lower prevalence of serious assaults than was typically specified in their respective assessments of improbability or in testimony regarding relevant anchoring base rates. Even when departing from any reasoned proportionality and utilizing broad operational definitions where little or no injury occurred, or where there was only the unrealized potential, violence remained quite improbable among the offenders in this study. In addition, almost half of these offenders had maintained perfect disciplinary records, having never been cited for disciplinary misconduct of any sort. In addition to their low probability of assaultive misconduct, comparisons with inmates in high-security federal prisons demonstrated that the capital inmates were also not a disproportionate risk for institutional misconduct, regardless of the level of disciplinary violation or violence-related infractions specified. How do we account for offenders who had committed such horrific crimes in the community having such low initial rates of serious prison violence? Two explanations have particular merit. First, as Monahan43 articulated over 25 years ago, violence is rarely simply a function of the individual. Rather, it emerges from the intersection of the person in a particular interpersonal interaction in a given context. Prison is quite different from the community in its interpersonal interactions and in the restricted nature of its context.14,18 The effect of these marked differences is to sharply limit the frequency of serious violence in prison, even though almost half of state prison inmates at any time point are serving sentences for violent felonies. Capital offenders are similarly affected by these differences. Second, capital offenders are long-term inmates. Prisoners serving long sentences have been reported as taking a different perspective on doing time. To illustrate, Flanagan53 found from interviews of long-term inmates that, by virtue of their projected tenure in the institution, they had greater incentive to preserve the privileges allowed to compliant inmates (e.g., commissary, visitation, recreation, work roles). As Flanagan described: One of the primary themes that emerged from these interviews is the self-perception of long-termers that they are in fact doing a sentence different [sic], qualitatively, from that of the short-term prisoners who occupy similar cells in the same facilities. Although long-term inmates are not necessarily more accepting of their situation than short-term prisoners, they appear to more fully realize the need to co-exist with correctional authorities within the confines of the institution. The view expressed by many long-termers is that short-term prisoners have little to lose as a result of misconduct and thus treat any exchange between inmate and officer as a confrontation. Instead of pitting themselves against officers, long-term inmates have learned to circumvent potentially “sensitive” situations [Ref. 53, p 364]. The inmate characteristic reported to be most strongly related to inmate misconduct in prior studies, age at incarceration,17,18,22,29,34,36,39,54–56 was also found to be the best predictor of potentially violent rules violations in the present study. Although no predictive factor apart from age reached statistical significance, an inmate characteristic found to be related to inmate behavior in previous research, educational level (e.g., Refs. 36,39,57) was related in the expected direction in this study. Aspects of the methodology of this study and its findings bear additional discussion. The participants were drawn from the files of a single expert. This convention was notable in representing the first instance of an expert testifying in the capital risk assessment arena to self-report the available prison outcomes of these respective defendants. Reporting of outcomes of surgical or diagnostic procedures or other treatments by individual or affiliated physicians utilizing a common protocol is relatively common in the medical literature, but unfortunately is infrequent in the forensic mental health arena. The absence of such publicly accessible outcome data can allow faulty methodologies to go unchallenged. Indeed, the arguably notorious capital testimony tenure of Dr. James Grigson (a.k.a. Dr. Death) was not substantially curtailed until he was challenged on the stand at capital sentencing in State of Texas v. Jack Wade Clark58 with the generally favorable prison outcomes of 11 Dallas County inmates regarding whom he had predicted certain future violence. These 11 inmates had then been sentenced to death at trial and subsequently had had their sentences commuted to life or reduced to a term of years. The convention in this study of utilizing the cases of a single expert provided uniformity in the associated risk assessment methodology, even as the underlying data progressively expanded and was updated with continuing research. More practically, the files of the senior author represented the primary repository of federal capital and multijurisdictional state capital risk assessment and risk-related testimony utilizing the group statistical methodology previously specified. A single-expert methodology, however, may be two-edged. Are the predictive outcomes of a single expert sufficiently informative to be of scientific merit? Four factors suggest an affirmative response. First, there is no other report of the predictive accuracy of capital risk assessments of improbability of prison violence that would provide a contrast to the outcomes of state-sponsored testimony reported by Edens et al.21 Second, despite the attrition in the state capital offender portion of the sample, the number of capital case outcomes reported (n = 73) is not inconsequential in reflecting the prison outcomes of capital offenders. Third, the methodology and data underlying the associated capital risk assessments and risk-related testimony have been reported in both literature reviews and empirical papers, including many cited in this article. This publishing history renders both the methodology and associated data an open-source protocol that should generalize to other mental health experts who avail themselves of this literature. Fourth, as described previously, the current study is only the second investigation to report multijurisdictional capital offender outcomes. A single-expert method raises the specter of experimenter bias as well. This concern is doubly magnified in this instance, as the senior author is one of the principal architects of the application of group statistical data to violence risk assessment for prison at capital sentencing and, as the current study reflects, the self-report of the predictive outcomes of this methodology. These assessments also constitute a routine aspect of the senior author's practice and associated income. Thus, the scholarship and practice that have resulted in a reportable sample also have a stake in the outcomes of that sample. The design of the current study has sought to negate the influence of such factors by tasking research assistants to review and code the relevant case files; by utilizing clear, disaggregated operational definitions of inmate violence that minimize subjectivity; and by having the second author independently analyze the coded data and prepare the Results section of the study. Another problem involves sample restriction. Capital offenders who are referred for violence risk assessments by defense counsel, as well as cases in which the defense requests testimony on risk assessment methodology and/or prison capabilities, may involve offenders who have been preidentified by counsel as better institutional risks. In numerous additional instances, informal preretention consultations with defense counsel resulted in the attorneys electing not to proceed with a formal risk assessment. More problematic offenders, then, may have been excluded from consideration. In support of this hypothesis, the rates of violence among the capital inmates in the current study were substantially lower than those observed in recent studies among either federal29 or state34 capital inmates serving capital life sentences. In light of the potential exclusion of the more problematic defendants from this sample, studies examining rates and correlates of misconduct among entire cohorts of capital inmates (e.g., Refs. 29,34) or convicted murderers (e.g., Refs. 22,30,59) are preferable for specifying probabilities for capital offenders as a class. That caution, however, does not reduce the importance of data regarding the defendants who are the subject of defense-retained expert testimony at capital sentencing. Even if the capital defendants referred for defense-retained risk testimony at capital sentencing regarding future prison conduct represent a restricted sample, the outcomes of such defendants arguably illuminate the assessments of future defense-referred inmates who were subjected to similar preretention screening procedures. In addition, capital juries are likely to have an interest in the predictive outcomes of defense-retained expert testimony regarding the future prison violence of capital offenders. Other methodological questions bear discussing. While disciplinary outcomes were obtained for all federal capital offenders who had been subjects of violence risk assessments or risk-related testimony, such data were available for only a quarter of the relevant capital offenders in state custody. This lack of data raises the question of whether the results were distorted by the missing cases. Although this question cannot be definitively answered, there were no statistically significant differences in rates of misconduct when comparing the federal offenders where there was a 2 percent rate of attrition, with state capital inmates who had a 76 percent attrition rate. This comparability, combined with the uniformly low rate of institutional violence among inmates in this study, supports an inference that the lower proportion of state offenders for whom outcome data were available did not substantially distort the findings. Similarly, no statistically significant differences were observed between capital offenders on death row and life-sentenced inmates in the general prison population. This similarity suggests that confinement restrictions had relatively little effect on rates of prison misconduct among these offenders. Illustrating the counterintuitive impact that heightened security and movement restrictions may have, in a recent study of convicted murderers in Texas prisons,59 those inmates under solitary restrictions on death row in Texas had higher rates of assaultive violations (all toward staff) than the life-sentenced offenders had on inmates and staff combined. The higher level custody afforded by death row was effective only in preventing the less frequently occurring serious assaults. The follow-up period in this study averaged just less than five years. A counterresponse to the current extreme improbability findings, then, could be, “Not yet.” This is an understandable critique as the ultimate at-risk period is life-long among those facing a life-without-parole term in prison or until execution if death-sentenced. Inmates who exhibit violence in prison, however, tend to do so early in their prison tenures.22,35 Thus, the longer an inmate goes without serious institutional violence, the less likely such violence will ever occur. Another limitation involves the reliance of this study on official disciplinary records, resulting in the capture of reported violence only. It is expected that this dependence on official misconduct reports is most problematic for rates of lesser violence and potentially violent rules infractions. The outcome variable of greatest relevance (i.e., serious assault), is much less likely to go undetected. Serious assaults, particularly those resulting in injuries that require hospitalization, as well as all significant assaults on staff, are quite likely to be identified and reported. Finally, there is a question of whether there is sufficient variability in the predictive and criterion variables to support a viable test of predictive accuracy. Regarding the broadest predictive variable, all participants had been designated as improbable to commit serious violence in prison (i.e., no variability). A three-category assignment of degree of improbability was made for those receiving particularized risk assessments. Consistent with expectations, the trend was toward higher prevalence rates of potentially violent misconduct among offenders whose risk had been rated “above the base rate.” The misconduct rates for all severities of violence were quite low, however, providing minimal variability for either the singular or trifurcated predictive variables. While these results, then, do not comport with the assumptions of correlation analysis, it would seem to “throw the baby out with the bath water” to conclude that they are not meaningful. As a growing body of data reflects, the serious prison violence of concern to capital risk assessments has a very low base rate. These low base rates provide a critically important foundation for reliable risk assessments for prison, not an impediment to them.14,17,18,20 When, consistent with sound science, capital risk assessments for prison are anchored to these base rates, highly reliable estimates of an improbability of future serious violence result. The more severe the projected prison violence, the increasingly improbable its occurrence becomes. When prison risk estimates fundamentally deviate from or ignore these base rates, errors abound. Although this statistical reality is obvious to scientists, it may be less obvious to capital prosecutors or to the courts and juries faced with determining the sentencing fates of these offenders. Thus, reports on the contrasting outcomes (i.e., false positive, true negative) of capital offenders whose prison violence risks were assessed by prosecution- or defense-retained experts, respectively, can be both important and relevant to these consumers. For capital prosecutors, such contrasting accuracy may affect their elections to sponsor expert testimony asserting “future dangerousness.” For the courts, the contrasting error rates of state- and defense-sponsored assessments may influence rulings on admissibility of evidence. For capital juries, knowledge of these contrasting outcomes may assist them in evaluating expert testimony and having confidence, when adequately informed, in their own risk estimates and associated sentencing determinations. The assistance of Ronna Dillinger, PhD, Amy Nguyen, and Kiera Boyle is gratefully acknowledged. Disclosures of financial or other potential conflicts of interest: Portions of the authors' incomes derive from performing violence risk assessments for prison in capital cases and/or providing risk-related testimony at capital sentencing. To date, these capital evaluations have been requested of the authors only by the defense.